A friend of mine sent me this link. It made me cry..
check it out and maybe help him out. on Easter Sunday night, our dear friend Alex Darsey was walking by his house on 15th Street and 3rd Avenue in Brooklyn, when a scared little puppy approached him out of nowhere. A neighbor told Alex that they had seen someone throw the puppy out of a car and drive off. Alex brought him home and named him Walter. 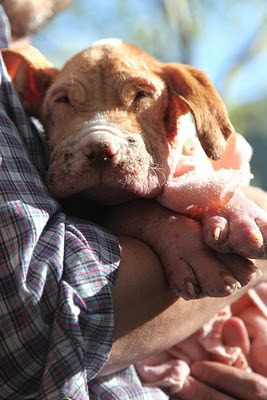 Walter was incredibly malnourished, dehydrated and was suffering from a severe case of Mange. On top of that it appears that his previous owners used some sort of chemical (like bleach or ammonia) in a cruel and misguided effort to treat the Mange. The fact that human beings could treat an innocent puppy this way and then leave him on the street to die is unfathomable, not to mention criminal. We brought him to the emergency room that night and to the Vet the following morning, and while all doctors agreed that Walter has a long road ahead, they felt that his condition is treatable, and that he has a chance to grow up and lead a healthy, normal life. They estimate that he is between 2 and 3 months old. He is INCREDIBLY SWEET AND LOVING. A group of us collectively decided to try to help Walter get better. The vet put him on antibiotics and anti-parisite medication, we bathed him with medicated soap to help sooth his inflamed, raw skin. After a few days of bathes, good meals and lots of love and attention from his new family, Walter seemed to be doing really well. However, 2 days ago, Walter lost his appetite, and his body temperature and electrolytes began to drop rapidly. We brought him into the emergency room again, His temperature was so low it didn't register on the thermometer. They put him in a sort of heated incubator and are giving him fluids through an IV. Presently his Mange is so bad that he no longer has his fur to act has an immune defense. His body is like a sponge for bacteria and infection, and he is so weak that he cannot fight it on his own. That being said, Walter is fighting...his white blood cell count is high (which means his body is aggressively trying to fight off the infection), and his general condition has improved since he admitted 2 days ago. Over the course of the last few days we have had to ask ourselves whether it is in Walter's best interest to continue treatment...He is not in pain, and he is fighting to survive. The doctors feel that with time and care he can beat the infection. Unfortunately emergency care is very expensive, and we simply don't know how long he'll have stay there. As long as he is fighting to stick around, we will fight with him. Any help you could offer would be immensely appreciated. There is no shortage of people to care for this little man and he does have a home waiting for him, we need to get him strong enough to make it there. No Donation is too small. You can donate by clicking the button below. Please pass this along to anyone you know who may be interested in helping save little Walter. For more pictures, updates an to become a fan of Walter please visit his facebook page. Walter is being treated at The Veterinary Emergency Referral Group and his primary care doctor is Hope Vet.